Standard party kit shown for illustration. 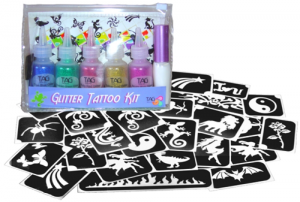 Glitter Tattoo Kit with 20 stencils, 5 glitters, 1 x 8 ml cosmetic glue, and sweeper brush. Glitter colours include: Bright pink, pure purple, apple green, silver and electric blue. Stencils designs include pretty flowers, fairies, butterflies and all things girls love! Ingredients are not available for the Glitter Tattoo Kits. Please contact TAG Body Art for further information. Click here for material safety data sheet for Pros-aide Adhesive. 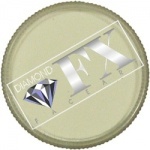 Click here for materials safety data sheet for TAG Glitter.